Last year, when Saucy Mama ran the "Fab with Five" contest, I thought it might be the most difficult contest that I could enter. Create a recipe using only five ingredients, including one of Saucy Mama's delicious sauces or mustards? Luckily, the sauces turned out to be so good, that it really wasn't all that difficult. While I didn't win, I had such a great time coming up with recipes that I was one of the first in line to sign up for this year's contest. 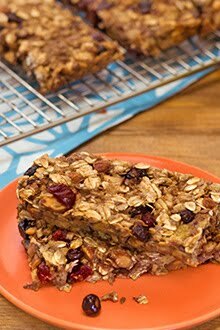 This year the theme is "Skinny Mama" and we, some 50 bloggers, are to come up with low cal or gluten free recipes....healthy stuff. Yikes. The last recipe I posted was for Carrot Cake Pancakes. I wasn't so sure I could do this. Then, the box of mustard arrived in the mail. You can win a selection of three mustard's...see how below! Since my last recipe was a rather caloric, albeit tasty, breakfast entree, I thought I would start with a healthier breakfast idea. First, mix the yogurt, mayo, mustard, lemon juice and water together; set aside. Heat two teaspoons of olive oil in a large skillet. Add the polenta slices and fry them over medium/low heat for about 5 minutes on each side, or until golden and crispy. Remove from skillet and cover to keep warm. Add an additional teaspoon of oil to the skillet and add the fresh spinach. Saute for 3 or 4 minutes, or until wilted and heated through. Season with salt and pepper to taste. Remove the spinach from the skillet. Spoon the mustard sauce into the warm pan and cook for about a minute until heated through. Arrange two polenta slices on a plate. Top each slice with 1/8 of the spinach and a poached egg. Drizzle the sauce over the egg; repeat for each polenta slice. Sprinkle with freshly ground pepper. This recipe will serve 4, two eggs each. I love a nice runny yolk, but if it's not your bag, simply cook your egg longer. How easy was that? And thanks to the Saucy Mama mustard, the sauce is tasty, gluten free, and low in calories. In fact, you can eat two of the eggs with sauce for about 325 calories! Not too shabby. Now, how about that giveaway? Saucy Mama is generously giving away a three pack of mustards to one of my readers. Simply leave a comment telling me what kind of recipe you would use your Saucy Mama mustard in and you will be entered . On Wednesday, February 29th, Saucy Mama will open the voting polls on her Facebook page, and you, our readers, will decide which 10 recipes will be in the final judging. 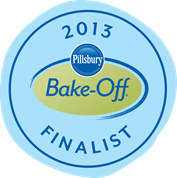 For additional entries, simply vote for the recipe that you like best, and come back here to let us know you voted for your favorite. Winners will be chosen using Rafflecopter on or about March 7th, 2012. Good luck and enjoy all of the creative entries! Disclaimer: I was given a Saucy Mama box of condiments in order to create this recipe. All opinions, as always, are my own. It's been nearly 3 weeks since my visit to the Red Gold Tomato facilities. I think it's about time that I finish the story, no? When we last spoke about my great adventure, the limousine had just dropped us off at the hotel after a terrific meal at Bonges Tavern....you can read about it here. The seven Red Gold Bloggers were up bright and early on Saturday---we had a big day ahead of us. The first thing on the agenda, was a trip to Red Gold's Elwood facility where we were meeting for breakfast and a tour of the plant. Standards are high--only 53 farmers are considered "Red Gold" growers. Red Gold partners with these growers to determine field selection, soil fertility, staggered planting schedules, and variety selection. 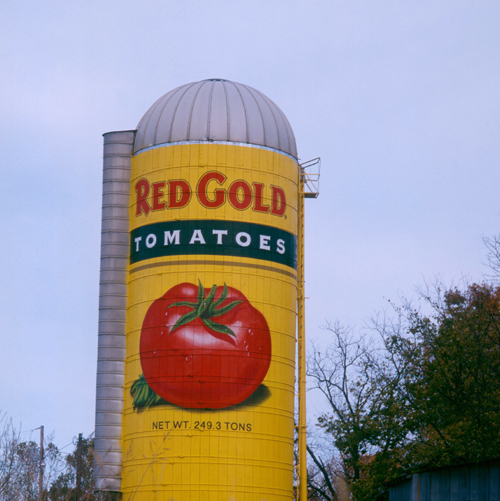 Red Gold distributes tomato products to all 50 states and to 15 foreign countries. 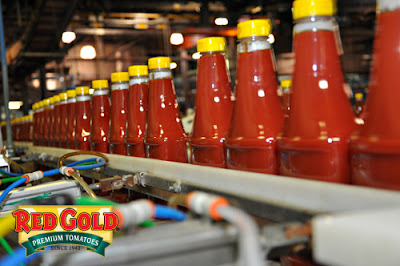 Red Gold is the largest privately owned producer of ketchup in the country. Red Gold produces enough tomatoes to reach the moon and back! While the facts are interesting, the actual tour was very telling. We were asked to remove jewelry, scrub our hands, and wear hairnets for our walk through the production area. The high standards were very evident---it was clean! Not that I expected it not to be clean, but everything was sterile. They even wash the walls! Just that morning, I had heard of another food recall (from my own state)--it was such a relief for me to see a company that had such high standards to ensure excellence. Since it wasn't "tomato season" while we were there, we didn't get to see the actual tomato canning, but we did see some ketchup production. From the washing of the plastic bottles, to the big vats of steaming ketchup, to the filling of the little ketchup packets, we were given the grand tour. I was feeling pretty good about ketchup at that point. Later, we were able to compare Red Gold products with some other major brands and we met ﻿Project Development Manager, Emily Jones. Have you ever put different brands of tomato product side by side? My guess is no. This is where I was so surprised. Look at the picture above, with the two kinds of tomatoes next to each other. You can actually see how smooshed the other "major" brand is...plus it had the tough ends and tomato skin still hanging on it. The juice was watery and separated...ewww. This, more than anything, had me convinced of the Red Gold quality. Next, we were treated to lunch at the new Red Gold headquarters. Can you believe they bought an old elementary school and converted it into offices? We were honored to have lunch in the new cafeteria...which was previously a basketball court! Lunch was prepared by Linda aka "Red Gold Lady". Among other things, she treated us to a fruity, tomato salad and some tomato crescent pinwheels...it was very tasty! After lunch, the limousine brought us back to the hotel for a little rest before the big night ahead of us...we were going to The Taste of the NFL! Because this was a strolling food and wine event, we were given a wine glass and a plate when we entered the building. Each NFL team had a station set up with chefs that they felt best represented their home town. The food was amazing! I think my favorite was the Smoked and Slow Roasted Pork Belly over Michigan White Beans at the Detroit Lions station. Or maybe it was the "Beef On Weck" with Fresh Horseradish, from the Buffalo Bills, or the Lemon Gnocchi with Shrimp, Crab, and Asparagus from the Washington Redskins. I take it all back. It was the Purple Velvet Cupcake from the Franklin Street Bakery in Minneapolis...at the Vikings station. Delish! While the food was great, the people watching was even better. Over 3,000 people attended this event. All in all, my Red Gold Blogger trip was fabulous. Not only did I glean some good tomato knowledge, I got to rub elbows with some wonderful people. And let's not forget our wonderful Red Gold Tomato Hosts. You can find recipes and information on Red Gold's Facebook page, as well. 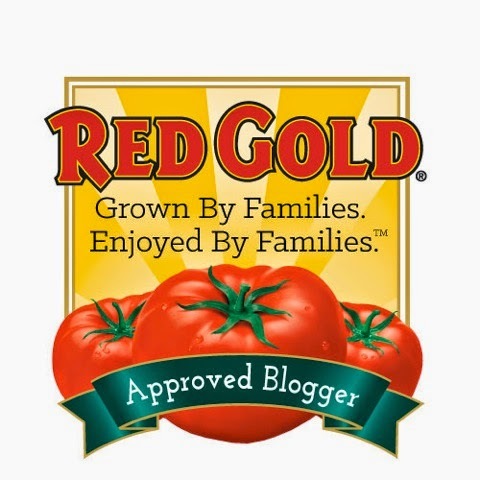 Disclaimer: My trip to Indiana to meet with the Red Gold company and to go to The Taste of the NFL was given to me as a prize by the Red Gold Tomato Company. As always, my opinions are my own. Cookbook Cafe....publish your own cookbook! 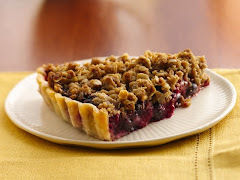 Many of you have heard me talk about Bakespace.com....it's a recipe website that doubles as a social networking site for foodies from every walk of life. Babette Pepaj, the founder of Bakespace envisioned a place where people could meet, bond, and share recipes. 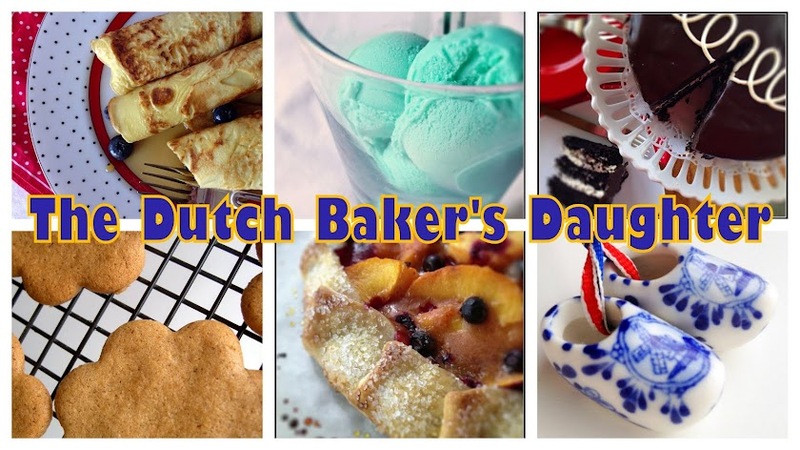 She started Bakespace back in 2006, and since then it has evolved into one of the premier recipe sharing sites on the Internet, winning awards and accolades all along the way. Ok, so what's my point, right? Well, today Babette is launching a great new idea that I've been privy to for a few months and I'm so excited by it that I really want to share. Have you ever toyed with the idea of publishing your own cookbook? 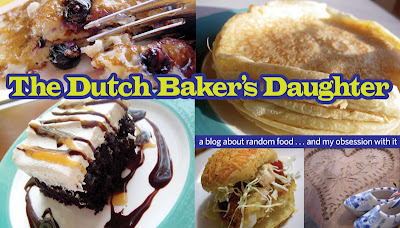 Cookbook Cafe is a place where you can do it for free! Think about it--no trying to find a publisher and then shelling out big bucks to see your book in print. 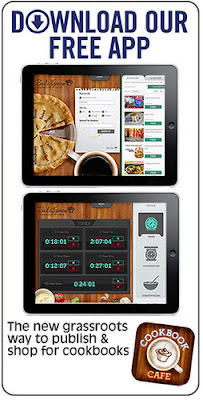 Cookbook Cafe is an app for iPad, but you don't need an iPad to access or use it. It is as easy as uploading recipes on to the Bakespace site (make them private if you want), create the cookbook, and publish. You can even charge money! Think about the possibilities. Fundraising? No publishing costs...just gather your recipes, make the cookbook, set the price, and promote your book. Are you a blogger? Gather your most popular recipes and offer your readers an easy spot to find them. But, you really want to publish a "real" cookbook, right? One you can wrap your hands around? Instead of waiting years to actually publish, why not test the waters with a quick virtual version? It may just give you the recognition you need to get your dream cookbook published! At any rate, it is worth a look, right? If you have an iPad, just look for the free Cookbook Cafe app and download a few cookbooks. Let me know how it works, because I don't have an iPad, yet. :) If you're like me and haven't updated to all the fancy gadgetry, just pop over to Bakespace, login, browse and download some free cookbooks. You might even find mine. It's that time of the month for another Improv! If you're not familiar, each month Kristen from Frugal Antics of a Harried Homemaker hosts a little party with a theme. This month the theme is Carrots and Ginger. Why is it that I keep thinking that I have these really cool original ideas, only to find that they've been done? Again, when I googled my idea, it was all over the place. Carrot Cake Pancakes, indeed. Thank goodness they are good enough to repeat. 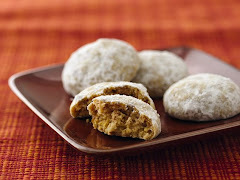 Plus--these have ginger!! Heat a griddle on medium-high. 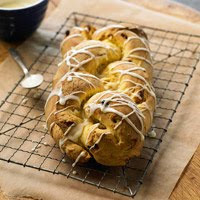 Whisk together flour, baking powder, baking soda, cinnamon, salt, and sugar in a medium bowl.In another medium bowl, add eggs, buttermilk, and 4 tablespoons butter; whisk to combine. Mix in carrots, pineapple and ginger. Add to flour mixture and stir with a wooden spoon until just combined. Batter should have small to medium lumps. I found it easy to grate the ginger with a Microplane grater. Mush the pineapple in a strainer with a spoon--then give the juice to someone you love. Remember not to over mix. Small lumps are a good thing. Brush a little melted butter on the griddle. Pour the pancake batter by ¼ cups onto the griddle, keeping the pools of batter 2 inches apart. When pancakes have bubbles on top and are slightly dry around edges, about 2 1/2 minutes, flip over. Cook until golden on bottom, about 1 minute. You could just top them with some syrup at this point, but why not take it to a new level? Combine the cream, maple syrup, corn syrup, cinnamon, and ginger in a small, heavy saucepan. Heat on medium-low, stirring constantly, until the mixture comes to a boil. Lower the heat and simmer for 15 to 20 minutes, or until the mixture is reduced and thickened. Serve warm over pancakes. Or add some bourbon and serve over bread pudding. If it looks familiar, it's because I used this (minus the cinnamon and ginger) with some added whiskey to pour over my Green Apple Pie. Be sure to click on some of the other links to see what everyone has been busy cooking! A warm welcome from Monica set the tone for the weekend. A local high school glee club entertains at the airport. Before I start waxing poetic about Red Gold Tomatoes (and I will--they are fantastic), let me share with you the people behind the product. A happy company makes for a better product, don't you agree? Our first contact with the Red Gold company was with Monica, who works in marketing. For lack of a better term, Monica was the "blogger wrangler" for the duration of our stay. She was with us from the airport until we all hugged goodbye. Monica was joined by Theresa, when we got to the hotel. The two of them made sure we had lunch, got to know one another, and each received a goodie bag full of Red Gold logo products. Two sweeter people can not be found. Theresa and Monica--don't they look good in red? Friday night, we were taken to Bonges Tavern, where we met the Reichart family, Brian and Selina and their son Colt. Red Gold began in 1942. Now, 4 members of the third generation Reichart family are involved in the day-to-day operations, and several of the fourth generation work there as well. Today, Red Gold is one the largest privately owned tomato processing companies in the country. I have to tell you, though, the Reichart family is as down to earth as can be. They made us all feel very welcome. Here I am with 6 of my new blogger buddies. Theresa, Monica, Colt Reichart, Selina and Brian Reichart and ---all the way at the end---is the Red Gold Home Economist, Linda (The Red Gold Lady). The food at Bonges Tavern was fantastic! The waitress rattled off a list of things for us to choose from--all of them sounded delicious. 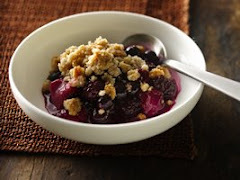 We shared some appetizers, including a crab cake that was to die for and for dessert we all had a taste of the house favorite, Sugar Cream Cake with Blueberries. Yes--I will hunt for the recipe! As the night grew to a close, the weary bloggers climbed into their chariot...a big white limousine that was theirs for the weekend...and went back to the hotel for some shut eye. Saturday was going to be an even bigger day.